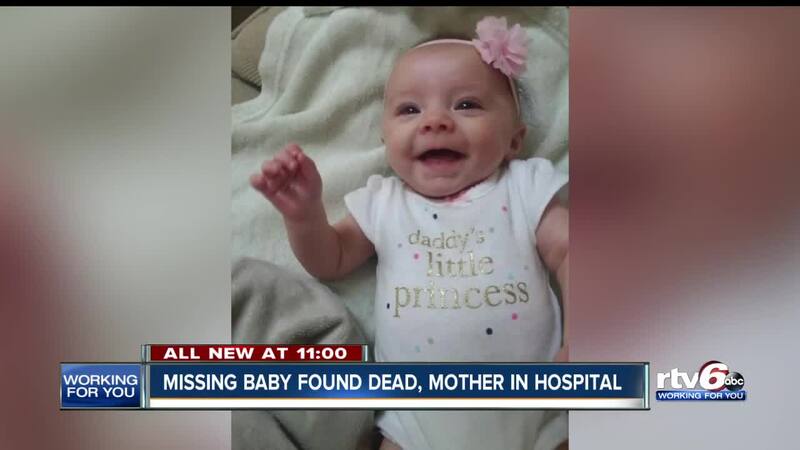 Missing baby found dead, mother in hospital. INDIANAPOLIS — A missing person report turned tragic when a baby was found dead on Tuesday afternoon. Police say 36-year-old Rachel McAfee is being treated at Eskenazi Hospital for frostbite after being found in her car, in a north side neighborhood, with her 3-month-old daughter, Emma. Investigators told RTV6 the mom is in stable condition, but the two-month-old was pronounced dead at the scene. "This is extremely tragic," Indianapolis Metropolitan Police Department Chief Deputy, Chris Bailey, said. Police found Rachel McAfee in below-zero wind chills Tuesday. A homeowner called 911 to report a woman and baby inside of a gray Subaru. Investigators called off the search. "They were in the process of working with state police to issue a silver alert based on some of the medical conditions," Chief Deputy Chris Bailey said. According to police, she's been battling postpartum depression and might have been suicidal. "There are resources available, even though we can't speak to this specific situation," Sara Pollard, an Indiana Coordinator of Postpartum Support International. "We think of pregnancy and being a new mom as a happy, joyous time. But certainly we know that as many as one and five, to one and seven women, will have symptoms of some type of mood or anxiety disorder." It depends on the person as to what symptoms will occur. "It can be guilt. It can't be feeling overwhelmed. Maybe even some sadness, some 'this isn't what I thought it would be,'" Pollard said. "'This is harder than I anticipated.' So that's very unique to each woman who is experiencing symptoms." Pollard wants moms to know you're not alone. "Please don't hesitate to reach out. Please don't suffer in silence. There are people out there. Many of us that volunteer with Postpartum Support International are survivors." It's important to point out that there is no direct correlation between perinatal mood disorders and infanticide abuse or neglect. In August, Postpartum Support International is hosting an event in Carmel, titled: Climb Out of the Darkness walk. For more information, click here.